MALAY cuisine varies from one state to another, so the opportunity to sample famous delicacies from all over peninsular Malaysia under one roof is a mouthwatering experience not to be missed. Diners can sample these traditional dishes at Hotel Maya during Ramadan, thanks to the vast culinary knowledge of its chef de cuisine Hasbullah Sabani. ?My mother-in-law is from Perak and I have friends from different states. On top of that, I love to travel to various parts of the country to learn how the dishes are prepared,? said the Johorean. ?Preparing traditional Malay dishes requires a lot of time and effort, our kitchen has to start early in the morning to get everything out on time. Still, customer satisfaction is our biggest reward,? he said. Hasbullah said they do not use coconut milk, opting for healthier alternatives such as milk and yoghurt. Diners can treat themselves to more than 100 types of dishes and desserts at the buffet. 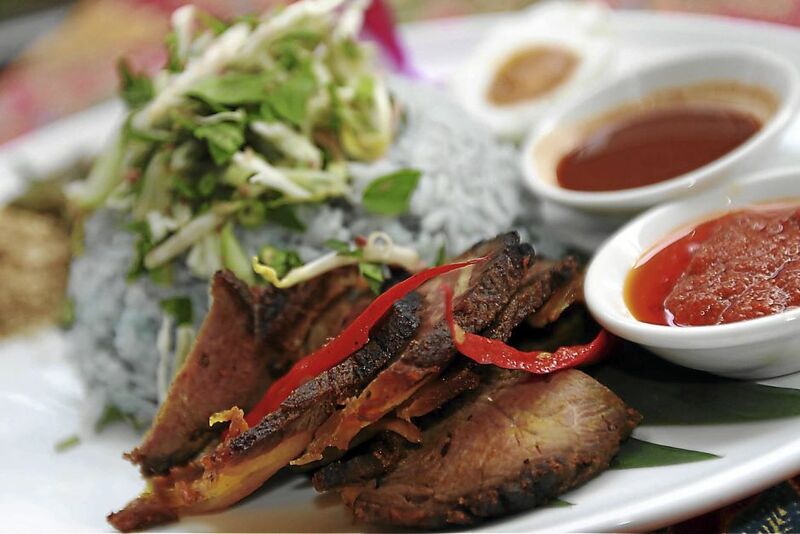 There are also several stalls serving the delicacies piping hot, including barbecued Australian lamb. Hasbullah said this dish was a marriage of east and west as he uses oregano, thyme, nutmeg, lemongrass, ginger and galangal to marinate the lamb. The wide selection of dips ranging from mint and mustard to brown sauces brings out the flavour of the meat well. The Nasi Kerabu corner is in itself a journey of flavours. The blue rice dish from Kelantan comes with a variety of sambal, pickles and salads that offer an appetising crunch to the fish and beef curries. The Nasi Kandar corner showcases delights from Penang, and Curry Red Snapper Head is a dish diners should look out for. Hasbullah said more than 20 types of herbs were used in the preparation. ?It is also very time consuming as a lot of slicing and blending of the ingredients is involved,? he said. The dessert corner filled with traditional Malay kuih including Kelantanese and Terengganu favourites is equally tantalising. Do leave room for the refreshing nyonya cendol or the heartwarming durian sweet congee with sticky rice, too. The Rasa Semenanjung Buffet (6.45pm to 10.30pm) at Maya Brasserie is available until Aug 7, at RM116 per adult and RM70 for children between five and 12 years of age. High-tea buffet will be available during Hari Raya (Aug 8 and 9) at RM69 per adult and RM45 per child.